Military service men and women are often called upon to settle into new posts across the country, AS offers many free benefits to assist them in their move. Why do I need a real estate lawyer? For the majority of home buyers, the purchase of a home will be the single largest purchase and investment in their lifetime. The legal process can be overwhelming for some, and simply put, you want to ensure that the transaction is smooth and comfortable. The importance of working with experienced real estate lawyers cannot be overstated. At AS, our lawyers are seasoned and professional real estate practitioners. Many have practiced real estate law in Canada for over twenty years. At AS, our lawyers practice designated law. That means that their preferred areas of practice include real estate and related transactions. Our experience includes legal negotiation, arbitration, conflict resolution, and if necessary, real estate litigation. Our mission is to provide outstanding service at competitive rates while ensuring our clients are fully protected and have a happy and successful experience using our law firm. 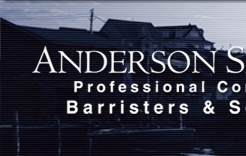 If you need a real estate lawyer in Nova Scotia, Atlantic Canada, or even across Canada, call us today! © 2014 Real Estate Lawyer Halifax Nova Scotia Canada. Anderson Sinclair NS All rights reserved.